Are you running the pingtest.net over wired or wireless (or even powerline)? edit: both tests were run from the same PC, which is why I can't understand the discrepancy. Even now when I look at the TBB graph it says I've had a smooth run all afternoon which hasn't been my experience! That's quite a big discrepancy, how do speed tests on speedtest.net and TBB compare? Do the IP addresses http://www.thinkbroadband.com/ping and http://www.thinkbroadband.com/ip.html match? If you go Start > Run > cmd and type ping 80.249.99.164 -n 100 then post the summary at the end here. I'm wondering if the fact that both sites will be using servers in different locations could possibly affect that? If they did I'm not sure if would be to that extent for either ping or speedtests though. Try http://www.speedtester.bt.com and see what that says. 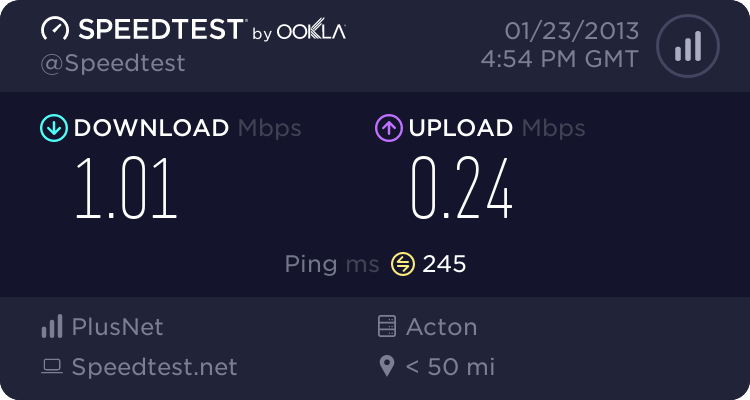 TBB is checking the connection from the Internet to your router, pingtest.net and speedtest.net are testing all the way back to your machine. That kinda points towards a problem between machine and router. The results of the extended ping to the router would be interesting to see. Glad to see that it's improved for you. Let us know if anything changes.